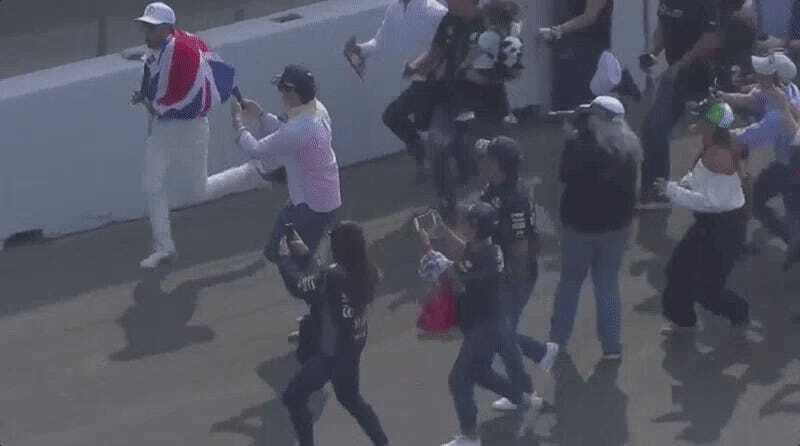 When Lewis Hamilton clinched his fourth Formula One world drivers’ championship in Mexico, he did all the usual things: hold up the British flag, say thanks to his team over his in-car radio, and rip a few sweet donuts. Then as Lewis ran through the crowd, two fans in particular had a very bad time. Pay close attention to two dudes to the right of the screen at around 10:18 in the video above. That looked like it hurt! On one hand, these dudes ate it on a broadcast feed that’s sent around the world. On the other hand, they ate it trying to keep up with a four-time F1 world champion. I think they get a free pass just on the cool factor of that alone. It’s pretty rad that Hamilton ran out in to the crowd to be with his fans after the race, so live it up. Next time, please watch where you’re going a little better before you accidentally run into another dude or get stuck in someone else’s way, though. I’m just saying.